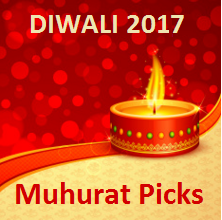 The "muhurat" trading session will be of 60 minutes, to be conducted between 6.30 PM to 7.30 PM tomorrow on the Diwali day, 19th October on leading bourses NSE and BSE. The special trading session would be conducted to pay obeisance to Lakshmi, the Hindu goddess of wealth and prosperity. It would also mark the New Year for traders as per the Hindu calendar, or Samvat 2074. Since last Diwali, Sensex and Nifty have given returns of 16.6% and 18.2% respectively (as on 18th Oct'17). 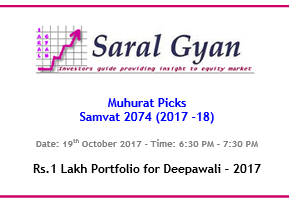 The probability of the stock market giving double digit returns in Samvat 2074 is similar like the year gone by. Back to the present scenario, the road ahead seems promising. However, the global events are likely to dictate the trend in the near future.